There’s more than one cup that you need in your daily life for the different beverages that you will be drinking. There are dainty cups for tea, hefty mugs for a good cup of coffee, even wine glasses when you feel like having a tipple or two. This is where these racks come in handy as they are good for drying and displaying them. For a little bit of country flair, this rustic yet dainty rack is just the thing for your home. With the addition of the bold red mugs, it completes the look! You can always tell the time with this cute rack or just break the rules, it doesn’t matter. However, the best thing about this rack is that you are able to keep your wine glasses within easy reach which is very convenient. 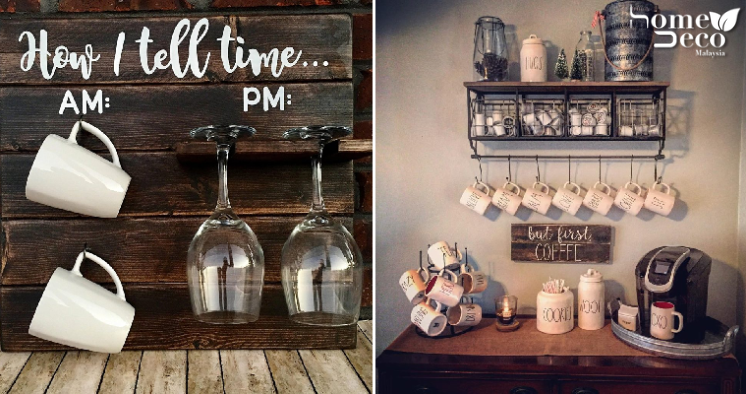 This distressed wooden rack not only looks stylish, it’s pretty functional too especially as it allows you to display so many mugs at once. To make it look even more trendy, you can consider getting mugs in muted colours. If you have a cute teapot or kettle that you want to display as well then this tiered stand works really well too. It allows your mugs and pot to be the focal point of the room and is easy to carry around as well. Now, this is probably a coffee lover’s dream come true and with the addition of the wooden racks for your cups, you don’t have to worry that you won’t have enough cups for your coffee. The chalkboard wall behind makes it look more fun and casual as well. Who says that you can have only one mug rack at home? If you have many cups, do it your way and mix it up. You can have hanging racks and tiered stands or little shelves, it really depends on how you want to decorate your little nook.